Established in 1963, Rivers Homes has 24 newly renovated one (1) bedroom apartments located across the street from Warren Williams. This property has a balcony area; washer/dryer hook ups and includes water, central air and heat, refrigerators and stoves. 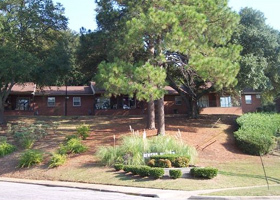 The resident's are responsible for utilities and parking is also available. Rivers' share an office and maintenance staff with Warren Williams. Rivers Homes has many resident programs and resources to enrich your life. The residents at this site have full use of the community room at Warren Williams that can be reserved for meetings, gatherings and recreational activities. The Ross program is designed for the residents which has an endless resource that offers transportation to many of Columbus' entertainment activities, exercise programs, health fairs, education seminars, shopping trips and much more. Lewis Jones is located nearby as well as Red Lobster, Locos, and Miriam's Cafe. There is only a short walk to Weracoba Park at Lakebottom and TIC for your financial needs. Rivers is also located near hospitals and the Health Department. These apartments are predominately designed for elderly and handicapped residents to give them a quality and enjoyable living experience.